« How can a single chamber pacemaker be physiological ? How to use the Esophagus , as an access for emergency cardiac pacing ? God has created and arranged every organ in an order with a purpose . The unique relationship of the food tube and the heart which run silently , posterior to the heart has evoked much interest for the cardiologists. Whenever LA is enlarged it pushes the Esophagus back .We also know the vintage clinical entities of cardiac dysphagia that occurred with rheumatic mitral stenosis. 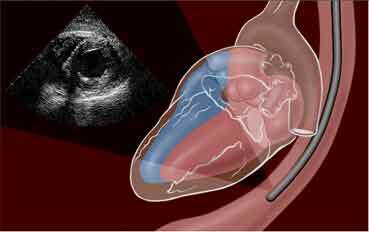 Since the lower end of esophagus just hugs the left atrium , this anatomical concept was successfully exploited for imaging heart in TEE.Now cardiac anesthetists routinely use the esophagus as an imaging port during complex mitral valve surgeries. How esophagus can be utilized to resuscitate the heart at times of emergency ? Note , the esophagus does a friendly hug as it crosses the heart posteriorly .It is a perfect anatomical sense , to Image and pace the heart from within the esophagus ! In a cardiac arrest situation , when we need to rapidly access to heart , we have multiple options .Each has some advantage and few draw backs. Emergency trans-thoracic needle pacing option is a primitive method still can save a life or two on it’s day ! after all , it reaches as close as possible to the heart ! How to convert a Ryles tube into a a trans – esophageal pacing lead ? There was a certain article on this topic , which I read , when I was cardiology resident. It answers the following. Distance form mouth , Discomfort of the lead , Pacing threshold , Esophageal burns . I am unable locate that article. Will post it once I get it. The most important limitation is it can pace only the atria with high degree of success. Ventricular pacing is not that successful for the simple reason esophagus is anatomically insulated by the atrial chambers. Tran gastric positioning may reach the basal aspects of Left ventricle , but the threshold needed is too high that will invariably cause discomfort.This can be used in a dying patient when there is no other option . * Primarily useful in acute SA nodal defects, sinus arrest or any other atrial electrical failure. Infra- nodal complete heart block trans esophageal pacing may not be effective . Overdrive entrainment of tachycardias , including resistant ventricular tachycardia is possible. Trans esophageal ECG recording . Good earthing is necessary .Burns can occur. Every cardiac physician is expected to possess the expertise to rapidly pace a heart by trans jugular /subclavian access at times of emergency . Further , any modern CCU will have a defibrillator equipped with trans-cutaneous pacer as well. (The disposable pads are too costly and is a deterrent in many hospitals !). This article explores other possible way to pace the heart in dire emergency situations.